How Bernie’s small-donor revolution could change politics on the left. The triumph of the Sanders insurgency was to democratize fundraising, one small donation at a time. Will it remake liberal politics? Democratic presidential candidate Sen. Bernie Sanders speaks during a campaign rally at Robert F. Kennedy Memorial Stadium in Washington, D.C.
By almost any measure, Barry Goldwater is one of the most important losers in the history of American politics. His landslide loss to Lyndon Johnson contained the inklings of a new GOP coalition and energized an entire generation of conservative activists who would eventually reshape and dominate the Republican Party. One of them was Richard Viguerie. In 1965, after Goldwater’s catastrophic loss to Lyndon Johnson, the young-ish Viguerie—first national secretary of Young Americans for Freedom—got into the mailing business. Starting from a list of 12,500 donors who’d given to Goldwater—culled from official congressional records and copied down in longhand—Viguerie built one of the most important political operations of the 1970s. It was simple: He would target these donors (and others like them) with mail that solicited and evangelized on behalf of various conservative causes. He collected countless thousands more names and addresses (and donations), and he would use the information to solicit and evangelize some more. Viguerie’s scheme was wildly successful—raising cash on a previously unseen scale—and quickly adopted by other conservative activists and organizations. In short order, “direct mail” would become one of the most important funding streams for the conservative movement, providing millions for organizing, giving fuel to a dynamic and dedicated grass-roots. In a real way, Viguerie’s revolution in mail paved the path for the election of Ronald Reagan and his conservative ascendancy. It was a mechanical innovation in the landscape of American politics that helped produce tremendous ideological and institutional changes that persist into the present. Most of the praise and postmortem on the Sanders campaign focuses on personality and platform. And it is true: Sanders is the most successful socialist candidate in American history who came within a stone’s throw of winning a major party nomination. He widened the universe of the possible with advocacy for universalist policies that would require huge expansions of the welfare state on par with the New Deal and Great Society. He took steps toward challenging Washington’s consensus on Israel and Palestine, and integrated—to an extent—left-wing critiques of American racial inequality. It’s been a remarkable run, hardly diminished by reports of strategic missteps and deep resentments. He’s right. It’s just as likely, he argues, that President Barack Obama—popular with the vast majority of Democrats and most Americans—represents the party’s future. But that’s not to say the Sanders campaign didn’t matter. It did. Sanders was able to fight his insurgency through to the end because he had the cash. Over the course of his campaign, he raised over $220 million almost exclusively from small donations (largely under $200), surpassing Clinton’s total if you exclude cash from super PACs and other groups. In endorsing Clinton on Tuesday, Sanders took a moment to single out these donors—“the millions of contributors who showed the world that we could run a successful national campaign based on small individual contributions.” This was indeed unprecedented. The main reason most intraparty insurgencies fail is resources. The “establishment” advantage is that its candidate will always have a steady flow of cash generated by major donors and other traditional sources. And that, in part, is how they win: by overwhelming opponents in areas—advertising, get out the vote—that require large investments in money and staff. When this primary began, conventional wisdom was that Bernie Sanders would suffer the fate of so many other insurgents precisely because he was disconnected from traditional fundraising sources. Establishment fundraising comprises wealthy individuals and powerful interests, as well as smaller contributions from ordinary people. But Team Sanders—building on the experience of Obama’s 2008 and 2012 campaigns—zeroed in on the lattermost group, tying the senator’s anti–Wall Street and anti–Citizens United message to a small-donor fundraising apparatus cultivated through constant engagement, online or otherwise. In public events like rallies and debates, Sanders always made the connection, linking his crusade to a call for donations. He used technology to streamline the process of making small contributions. The day after winning the New Hampshire primary, these donors filled the campaign’s coffers to the tune of more than $6 million. 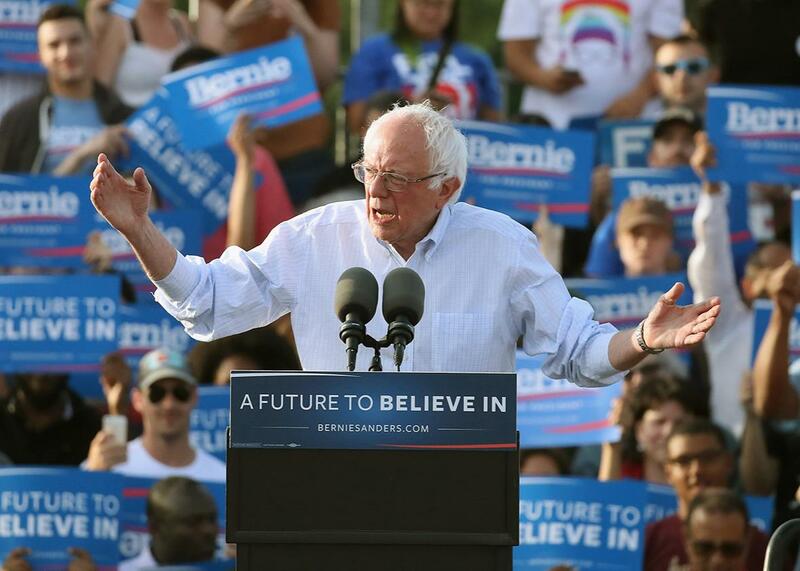 During the month of April, Sanders raised more than $25 million, a drop from his March total of $44 million. This was the greatest triumph of the Sanders campaign: To surpass establishment fundraising with small-dollar donations is to change how presidential politics is conducted. Now, candidates have space to marginalize influential factions and interests within the party—Wall Street, for instance—without facing an insurmountable deficit in election-year funding. That, far more than Sanders’ electoral performance, opens the space for more left-wing politics (although the two are related). It is hard, and often unwise, to make predictions about what will happen in politics. However, there’s a strong chance that the Sanders fundraising apparatus—which surpasses Obama’s in its scope and ability to rapidly raise huge sums—will end up as the senator’s chief contribution to progressive politics. Like direct mail, it could stand as a mechanical change to the business of politics that could sustain left-wing activists and reformists, if maintained and utilized. In the 1970s, direct mail opened up fundraising on an unprecedented scale, funding otherwise tough elections against “establishment” moderates, and linking conservative activists and politicians to active and potential supporters. Conservatives forged a tool that helped build a grass-roots network of voters and volunteers—one that played a vital part in swinging American politics to the right. Money was how the ideological became practicable. With its fundraising infrastructure, the Sanders campaign has built a 21st century analogue to the old right-wing apparatus. The only question is whether left-wing activists—and Sanders himself—can see the opportunity at hand to weave their ideology into the fabric of Democratic politics. Read more Slate coverage of the Democratic primary.